White enamel figures of children hand painted on colored or crystal glass was first developed by the artisans of Central Europe. The area was known as Bohemia and composed of the area now occupied by the countries of the Czech Republic and Austria. One of the major contributors to developing the high quality work of white enamel painting must be given to Friedrich Egermann. He developed this style during the early 1800s. This type of decorating is known in Europe as Quarkmanl, which means “White People”. By the 1880s, there were over one hundred and fifty glass factories operating in the Bohemia area. The biggest percentage of people living in this area derived their income from some aspect of the glass making industry. The Novy Bor was the center of all the glass decorating and glass was shipped in from all regions. The largest number of decorators was of German descent. Franz and Johann Pohl were some of Bohemia’s best known decorators. All of the decorators were close knit and taught each other different techniques. The painting styles were handed down to each generation. After being decorated, the glass was packed in that region and then shipped out around the world. Most of the glass decorated there was for export trade. The glass was imported into the United States and was soon being copied by several glass houses. One of the major glass companies at the time in the United States was the Boston and Sandwich Glass Company located in Sandwich, Massachusetts. Mary Gregory was one of their top decorators and worked there during the 1870s through 1880s. It has been speculated from early researchers that she used examples of these special painting techniques, to develop her own style. A famous illustrator of the time was Kate Greenaway of England and it has been previously written that Mary had really admired her work. With her own love of children as an additional inspiration, Mary set about to create scenes of children on glass, so the story goes. This style of painting done in the United States was soon associated with Mary Gregory. Somewhere along the way and no one can say for sure when, the glass began to be referred to as Mary Gregory. Possibly it came about to give honor to Mary after her death in 1908. Now her name has become synonymous with the painting of children in white enamel on glass, no matter which company made it and whether it was made here in the United States or from Europe. Over the years different people have disputed this connection and we are only reporting the various versions we have read. But for those that disagree, they themselves can’t come up with any better reason on why this glass is now all referred to as Mary Gregory. This fine lady did exist and she was a glass decorator. At other times, different researchers have even disputed the early claims that there was the Quarkmanl style of painting even done in the United States. Glass research always yields different questions and answers. We know for sure that this glass does exist but why it has become called Mary Gregory glass probably will be argued for years to come. But does any of it matter, since it is beautiful glass for all to enjoy and Mary Gregory is an easy name to remember. Can you imagine referring to this glass by the original European name of Quarkmanl? There are a few differences between the styles on the glass and we can only assume it is the difference between the European and American style of painting based on our readings, but we are only guessing. The European pieces, while mainly painted with white enamel, had the children’s faces fleshed colored and their clothing can sometimes be found with some color. These items also have gold trim on them. The American items use only white enamel paint. To tell the age of each piece, you have to look at each individual piece and look for characteristics of each company of the time period. Deming Jarves, the original owner of the Boston and Sandwich Company left in 1858 to organize a new glass company that he called the Cape Cod Factory. Later, Dr. Flower leased the factory and renamed it the Vase Murrhina Art Glass Company. It has been previously written that both of these companies made the Mary Gregory type of glass until their closures. We do not know for sure but are just reporting what we have read here. When the Boston and Sandwich Glass Company closed in 1888, the Mary Gregory style of glass in American was discontinued for almost seventy years. Several European glass companies have continued making this type through the years. The Julius Muhlhaus and Carl Hosch companies of the Novy Bor area produced some of the finest examples of the white enamel decoration. 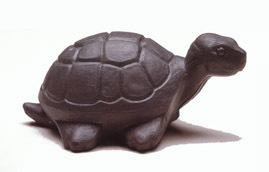 While children were primarily depicted, adult figures were also used along with animals and birds. After the end of World War II, all the glass factories in Czechoslovakia were nationalized and put under the name of Crystalex. They have continued to decorate their glass in the old tradition and style. 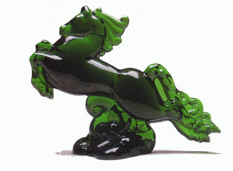 Many of the contemporary glass items can be found painted like the original pieces. The A & A Importing Company located in California constantly searches the world to find manufacturers to make items for their catalog. For several years they have imported Mary Gregory style glass from Europe to supply retailers in the United States. Documenting glass from the United States has been made much easier with the ease of obtaining American glass company catalogs. The first revival of Quarkmanl or Mary Gregory glass in the United States can be attributed to the Westmoreland Glass Company in the early 1950s. At that time, general manager, Bob Rupp, hired Edmond and Edward Pohl, brothers from the Czechoslovakia region. They were descendants of the Pohl family from Bohemia. They had immigrated to the United States after the end of World War II. After convincing Rupp to allow them to develop the Quarkmanl style of painting, they designed many different scenes on glass. It was felt that utilizing just children on the glass would encourage better sales. Westmoreland used a variety of colors on which to paint their children scenes. Usually only a single child was used on each scene but on a few occasions two children were used. The children were usually in action doing something such as fishing, playing, swinging or interacting with an animal. Many colors including Ruby and Black were used along with the satin colors of Blue, Brown, Green and Pink. No Cobalt was used at Westmoreland and should be noted that any pieces in this color would have been made by another company especially when they used former Westmoreland moulds. Three styles of plates, several vases and trinket boxes were decorated with the Mary Gregory style of decoration. Initially the pieces weren’t dated and signed. Starting in the 1970s, all the pieces were artist signed and dated. Westmoreland’s top decorator, Louise Plues, hand painted most of these pieces. Westmoreland continued making this glass until 1982, just three years before they closed their doors forever. This glass proved to be a top seller for Westmoreland. During the 1960s and 1970s, the LG Wright Glass Company of New Martinsville, West Virginia issued a small collection of Mary Gregory items. The six items were all on cobalt glass. The pitcher, tumbler and syrup all featured a girl standing among trees. The cruet, barber bottle and basket had a boy on them. The Fenton Art Glass Company internationally known for reviving old glass formulas and techniques offered their first version of a Mary Gregory style in 1991. As part of their Collectible Egg line, a Ruby egg was created with a lady ice skater in white paint. Production was limited to 1500. The following year in 1992, another special egg was created for Christmas which featured a shepherd and his two lambs, with only 2000 were made. For QVC, Ruby Carnival plate #C44179R was done with a Christmas scene of a wise man and shepherd looking at the special star. Also, petite bell #7463OG was offered in Dusty Rose as part of a bell collection. This piece featured a girl talking to her dog. In 1993 for Valentines Day, Ruby petite bell #7463RQ, was made with a boy holding flowers behind his back and talking to a girl. Martha Reynolds created this scene. The bell was limited and only sold until February 14, 1993. For the 1994 Valentine offering, another group of Mary Gregory style items was made in Ruby. These three items were in a line called Loves Me, Loves Me. All of these items featured the scene of a girl kneeling beneath a tree picking flowers and were available until October 31, 1994. There were 9” plate #8319RY, 6” bell #7463RY, and a 7 ½” oval basket, #8673RY. In 1995 another group of three in Ruby was offered and this time titled, Butterfly Delight, featuring a girl holding a butterfly. Sales again were limited until October 31, 1995. The pieces consisted of a 6 ½” bell #7463RG, a 9” plate 8319RG, #8637RG oval basket and a 4 ½” egg #5145RG. A Ruby Carnival bell #C76661T was made for QVC featuring an angel and star. Fenton made a change to their Mary Gregory style pieces in 1996 by offering two pieces in Cranberry for the first time. A 9” vase, #1554RP, depicted a girl sitting by a pond and limited to 1500. A 6 1/2” hat basket, #1532RK, had swans swimming in a pond on it. Collectors were delighted to learn more Mary Gregory was going to be offered in 1997 and all had different scenes on them. Each of the pieces was limited to 1500. A guest set, #1500DI, featured a girl in a spring breeze; a basket, #1539DQ, with a girl swinging was 8 ¾” tall; and a two piece fairy light, #1505DW, had a girl picking flowers. The 1998 Spring Supplement saw three more pieces and each was limited to 1950. There was a basket #1533DI that shows a girl with a basket, perfume #2906RK with swimming swans and a small pitcher #3275DM with a girl looking at birds. Mary Gregory was again offered in the 1999 supplement but the line was increased to four pieces. This time, a 13” lamp #3201RK was also part of the collection and had swans on it. The lamp was limited to 1250. While the previous years had only pictured girls on the pieces, this year there were two pieces with a boy on them. The boy is sitting under a tree at his favorite fishing hole. This scene is on the 5”vase, #3248R8 and 8” basket, #1613R8. The vase was limited to 1250 while the basket was limited to 2250. The last piece was a pitcher, #1671RD which had a girl with a butterfly and was limited to 2250. As part of the Collectible Egg collection, there was a #5146A7 Ruby egg that featured a girl gazing at a bird. The year of 2000 saw four more pieces: a lamp #1590DW, depicted a girl picking flowers; a basket #3281RQ, had a girl holding an umbrella and walking in the spring rain; a vase #6533R9 showed a girl picking apples and bell #3271RK had swans swimming in a pond. As an exclusive for their mini catalog, a 7” vase, #2977N8, was offered that showed a girl playing with a kitten. This vase was signed by Bill Fenton. For 2001, Fenton delighted collectors again with having four new items on Cranberry glass. A 10” vase, #1616Q2, showed a little girl having a tea party with her bear. The 8” tumble up, #3200DQ, featured a girl swinging. On the 8 1/2” basket, #2983DM, a girl was gazing at a bird. The last item was a 7” vase, #1573Q8, which showed a girl pushing a wheel barrow that held her favorite teddy bear. In 2002 four more pieces were added on Cranberry glass. A 5” vase, #3249M8, features a little boy sitting by his dog. Another vase, 10” tall, #5985MH, showed a girl riding her bike. A two piece fairy light, #1505MZ, had a girl sitting on a fence. The last item was a 11” basket, #1533MV, with a vintage lady golfer. In addition for QVC a two piece hurricane #CV393Q2 was made in Cranberry and a little girl having a tea party with her favorite bear. The collection for 2003 had four pieces in Cranberry. A student lamp, #2904J9, was offered with a boy and his dog playing marbles. Next was a 6 ½” vase, #1547B9, with a girl reading a book to small forest animal friends. A girl swinging was on a 4 ½” vase, #1537G9. The last piece was a 10” basket, #3283Y9, had a girl with her lamb. The 2004 Spring Supplement had an offering of five pieces. A three piece water set, #5906DG had a pitcher with two tumblers. It featured a boy and girl holding hands with two puppies sitting at their feet. A 7 ½” basket, #2989Y8, had a little girl giving a carrot to her pony. A #7424XE, rose bowl showed a fawn by a bush. The last piece was an 8 ½” vase, #1577Z1 that had a little girl in the garden. For 2005 was another collection of four pieces in Cranberry. An 8 ½” vase, #6538EE, had a girl jumping rope with her puppy looking on. Next was a #1505EC two piece fairy light with a girl sitting with her kitten and they are watching a bird. An 11” hurricane lamp, #8001EP, had a boy playing a drum. The other piece was a 9” basket, #2983ED, with a girl feeding the wild birds. In 2006, there were four more pieces in Cranberry. A 19 ½” pillar lamp, #8103SK, showed a boy holding his puppy. An 8 ½” vase, #6853UK, showed a girl at the sea shore. A 4 ½” pitcher, #5471HF, had a kneeling boy that was blowing bubbles A. The last piece was a 5 ½” candy box, #1515PF, with a girl playing with her kitten. In their general catalog was an offering of four different bells depicting the four seasons of the year. Winter was in Cobalt Blue and the decoration was done by Stacy Williams. The scene on this bell showed a child with his dog. Spring was in Emerald Green and showed a girl taking her kitty for a ride in baby carriage. This decoration was designed by Kim Barley. For summer, the bell was done in Violet and shows a boy playing baseball. Robin Spindler designed this decoration. The fall season showed a girl going trick or treating and this was done on Ruby glass. Frances Burton came up with this decoration. For 2007, Fenton made a big change in their Mary Gregory collection, with no Cranberry pieces being offered. Instead they choose to have an offering in their new color of Aubergine, which is a transparent purple. A 10 ½” basket, #6335C9, shows two kids shooting marbles and was designed by Robin Spindler. A 9” vase, #2955AY, has a girl at a window looking at the stars. A 5 ½” vase, #7688BD, has a girl brushing her dog. The last piece is a 6 ¼” pitcher, #8966D7, has a little girl playing with her kittens. Both the vases and pitcher were designed by Stacy Williams. These pieces were offered only in their Spring Supplement. For their General Catalog, a set of four pitchers were offered depicting the seasons of the year. Though advertised as a pitcher, it is actually a creamer, #8164, since it is only 4 1/4” tall. The creamer is a former mould from the Fostoria Glass Company. For spring is an Emerald Green piece that showed a child ballerina getting ready for her first recital. The summer pitcher was offered in Aubergine and showed a man playing golf. The fall pitcher was done in Ruby and showed a girl raking leaving. The last one is in Cobalt and has a girl building a snowman for a winter scene. All the Mary Gregory items, whether you collect old or new or a combination of both are absolutely delightful with their different scenes of children. This unique glass has continued to attract collectors that appreciate this special style of hand painted glassware. We congratulate Fenton on continuing with old world art to the delight of new collectors.